This week saw a momentous milestone in Lara's life. She moved out of her cotbed into a big girl's bed! Lara still needs to be woken up in the night to be taken to the toilet so you can imagine that we were a little worried about risking putting her into a single bed with a brand new mattress but I didn't want to buy her a thick vinyl waterproof sheet like she had on her old mattress because it used to make her sweat. 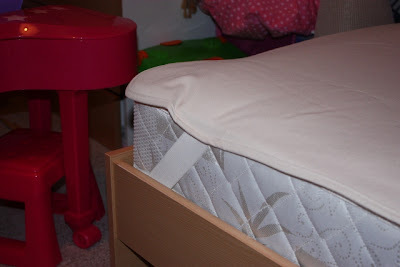 The Little Green Sheep came up with the solution when they asked us to review their organic cotton mattress protector. Lara sweats heavily at night so we only wanted to use a sheet made out of natural fibres. The Little Green Sheep specialise in organic baby bedding, along with a few other natural baby products. The Little Green Sheep organic cotton mattress protector is a thick unbleached cotton sheet that houses a waterproof membrane inside. 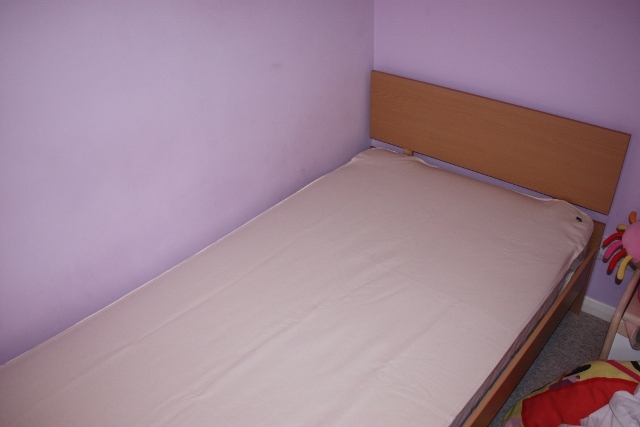 It is absorbent enough to absorb nightime accidents and prevent liquid ruining the mattress. The mattress protectors come in lots of different sizes from moses basket right up to single bed, as well as a few specially shaped ones for well-known brands of cot; prices range from £9.95 but the single sheet like ours costs £39.95. When I first opened up the packet I was a bit worried that it described itself as a flat sheet and I had images of me trying to fold hospital corners! Thankfully it has elasticated straps which allow you to slip it easily over the corners of the mattress as well as allowing the sheet and mattress to breathe. The mattress protector has so far proved its absorbency, thankfully not through a toilet accident but actually through an glass of water that Lara knocked off her bedside table (she hasn't quite got used to the new bedroom arrangement). The mattress was left untouched. Phew. Our Little Green Sheep mattress protector feels very soft so Lara doesn't even notice it is there, unlike the old crinkly plastic sheet. It is fully washable and tumble-dryer safe should it have to combat any bedtime accidents. I love this sheet compared to our old one and will definitely be buying one for Holly's cot when the time is right.